Mental illness of any kind is not an easy road. It is one that is full of roadblocks and flat tires. But it is one where so much power can be found. Both for ourselves and for those around us. I have spent much of my life not feeling like I belong anywhere and like everything I say and do is just different. I have often been called “difficult” and have spent much of my life wondering why I feel this way and why I do some of the things that I do. Since my journey to true health is just beginning I hope to be able to bring a light into someone else’s life. And I hope that I will have the strength to continue this journey no matter what it brings and hopefully have ability to bring some awareness and comfort to someone else along the way. Read the post in its entirety! 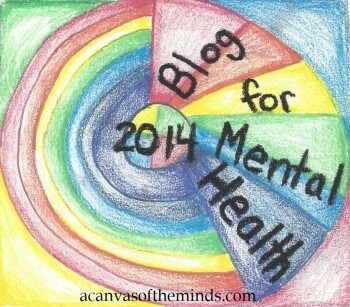 Visit Blog For Mental Health 2014 | learningtobebipolar. This entry was posted in learningtobebipolar and tagged Blog For Mental Health 2014, health and wellness, mental health on 2014/08/29 by Ruby Tuesday. I feel like I’ve broken some kind of unwritten rule by trying to be open about my mental health disability to members of the academic team. It’s strange, because you’d think that there would be less mental health stigma on a clinical psychology course, yet in some ways there is more stigma. It’s as if psychologists should somehow be immune to mental health problems (despite the fact that 1 in 4 people have a mental health problem). As trainees, we do not speak openly about our own mental health. Stigma also manifests itself in less subtle ways. The other day, whilst having a group conversation at university, another trainee noticed a packet of diazepam in my open handbag. She looked up at me and awkwardly apologised for looking in my handbag and then zipped it up, to ‘protect my privacy’. Would she have had the same reaction if it had been paracetamol or an inhaler that she’d spotted in my bag? I doubt it. Luckily, some people are amazingly supportive. My clinical tutor recently told me that my own experience of mental health problems will make me a better therapist, as I know what it’s like to be on the ‘other side’ and receive therapy and take medication. I hope that she’s right. Read the post in its entirety! Visit On being a Trainee Clinical Psychologist with Mental Health Problems | PsychConfessions. 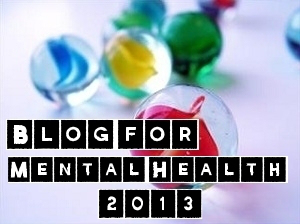 This entry was posted in PsychConfessions and tagged Blog For Mental Health 2014, health and wellness, mental health on 2014/08/29 by Ruby Tuesday. There are layers to everything – layers upon layers upon layers. Maybe you’re lucky and you don’t find life too hard or maybe you’re unlucky and you find everything very, very hard. Everything you think and say and do is made up of about a billion different factors and if you’re depressed, it can take some serious unpicking before you know what’s going on. Don’t rush to find answers – sometimes they will come to you out of nowhere. If you push too hard to ‘figure everything out’ too quickly, you’ll make mistakes and feel worse. It’s OK to be confused – the mentally well (much like the physically well) are lucky, not somehow ‘better’ than you. . .
Don’t ever, ever, EVER worry about how you are living your life. You’re not missing the boat or the bus or any other kind of form of transport. You’re not ‘wasting time’ being depressed. These are not the best years of your life. Let go of any idea of how things are supposed to be and any year can be the best of your life. There is no right and wrong, there is only a series of moments. Enjoy yourself when you can and be nice to yourself when you can’t. Read the post in its entirety! Visit Advice for 14-year-old me, living with depression | What Rhymes With Sarah?. This entry was posted in What Rhymes With Sarah? 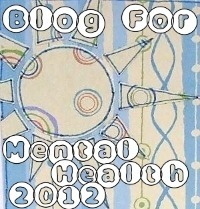 and tagged Blog For Mental Health 2014, health and wellness, mental health on 2014/08/29 by Ruby Tuesday. My mental health history started when I was 8-years-old. Genetics, life events and transitions shaped the progression of my chronic depression, anxiety, and eating disorders. I have been in and out of counseling most of my life, with little effect. Only last year did I become aware that I could not bear life’s pains any longer, and could not continue to distract myself away from them. I took leave from my job and spent 3 months in intensive outpatient therapy to treat Binge Eating Disorder. Of course, this disorder is born of anxiety and I have been working for the past year on being aware of what my triggers are and healing my broken heart. Read the post in its entirety! Visit Blog for Mental Health 2014 Project | Wounds to Feel. This entry was posted in Wounds to Feel and tagged Blog For Mental Health 2014, health and wellness, mental health on 2014/08/29 by Ruby Tuesday. Life is a series of swings and roundabouts, highs and lows, ups and downs and I guess lately I’ve felt kind of on the back foot. I’m pretty sure I know why, but knowing why, and knowing what to do are two very different things. Part of the problem for me is change, things are changing and I don’t like it but there’s little I can do about it. I known what I’m currently doing isn’t working, so I know it’s time for a change, I’m re-reading a book at the moment, which highlights one man’s journey with depression, it’s a good book (hence the re-read) but it is raising a few questions for me. . . I guess selfishly I’d always assumed my depression was something that I went through, I’m not saying I thought I was the only sufferer … I just hadn’t really thought about the impact my depression has on others. Smiles are apparently contagious, and in a similar way depression can be too, it’s hard to keep your own life on track when you’re worried about someone else. I don’t want my friends or family to feel like this too, which is why this time I’m taking some real steps to help myself. Read the post in its entirety! Visit July 15th 2014 | DeeThomson.com. This entry was posted in DeeThomson.com and tagged Blog For Mental Health 2014, health and wellness, mental health on 2014/08/29 by Ruby Tuesday. Because like I said in the post on motivation, at the end of the day, I still had dinner with my friends afterwards. And there were a lot of them last night, spanning 3 different teams, including the opposing team. I’ve had friends reach out to me because of my last two posts, reminding me that I can always call them when I’m feeling down. But in all honesty, the last thing I want to do when I’m feeling depressed is to contaminate someone else with my negative mood. I once dated someone who accused me of wanting to be depressed–I guess because he couldn’t talk me into feeling better. I think depressed people are accused of liking their depression because it’s hard to be in the presence of someone who you can’t cheer up. That’s why people who are just trying to be helpful say unhelpful things, which makes you feel even more depressed. So I just avoid it. But thankfully, God gave me tennis. No matter how bad I’m feeling, I can almost always motivate myself to play tennis. And the desire to win is so great that I forget everything and focus on hitting that ball. And after a few hours of doing this, regardless of whether I’ve won or lost, I feel like a different person. Plus we usually eat out afterwards, and I love food, too. Tennis, friends, food, and blogging. That is a winning recipe for treating depression in my book. Read the rest of the story! Visit Normal in Training: Wins and Losses. This entry was posted in Normal in Training and tagged Blog For Mental Health 2014, health and wellness, mental health on 2014/08/28 by Ruby Tuesday. I know for me, when I heard the words Bipolar and GAD, I was a bit relieved. I finally knew what was going on with me, however, I was not ready to shout it from the roof tops. I knew the diagnoses as did my husband, but I was NOT ready to admit them to anyone else. This is a bit of the victim part I was writing about. I was afraid of what others would say or do, how they would treat me, would they still want to be around me and be my friends? It took a few years for me to be open with friends and family. I found that once I discovered my courage and was “Brave with my Life”, that a whole new world opened up to me. A world where I willingly told my story to others and it actually helped them. A world where I found others like me and we have become life long friends. A world where my voice can make and has made a difference. I feel like I’m babbling a bit in this post, but I just want people to make the most of their lives. So we have a mental illness, it can be an incredible strength for good if you let it. There is so much more that we can do than we can’t. I say focus on what you can do, want to do and do it well. Don’t let the “stigma” be a deterrent. Use it as a driving force to show the world how great we are. When you see bad portrayals of people with mental illness played out in the media, write them and educate them. When you hear about a bill that you feel will do more harm than good, write your Congressional leaders. Let them know. When you hear someone making a joke about mental illness, correct them. Let them know that it’s not okay. Even if the person making the joke has a mental illness, it’s still not okay. Read the rest of the story! Visit “Be Brave with your Life” | BravelyBipolar. This entry was posted in BravelyBipolar and tagged Blog For Mental Health 2014, health and wellness, mental health on 2014/08/28 by Ruby Tuesday. It is of my view that people get too caught up in what I like to call the positive trap, to explain that further it is where people feel the need to be positive all the time, where people feel the need to look at someone of worse circumstances and say well it could be worse. But that does not in anyway excuse the fact that you are going through a tough time. I am not saying not to be positive, but rather to realize that it has its’ limitations. The positive trap, is something that prevented me from moving forward in getting treatment for my mental illnesses. . . I got so caught up in the positive trap. I put on a façade for five years- of positivity. . . In therapy, I am learning how to regulate my emotions, because with the assistance of therapy I have been able to express emotions that have been bottled up for years- now they just will not stop flowing. However, I no longer feel guilty for expressing emotions in front of my friends- I do not fear that they will not want to be friends with me because I am perceived as being negative- I am lucky to have found friends that adopt the “we are in this together” approach, I get that long negativity can be unhealthy and can have a detrimental impact on those around us. But a wise friend who I came into my life just this year taught me something so true that these words will never leave me; when she told me this I knew it was the moment I could trust her, and believe that she would always be there. She said… something along these lines..
“I don’t give up on my friends, even though the hard times. Because Shaz life is not meant to be easy, and you don’t give up on friends just because times are hard”. Read the rest of the story! Visit Daily Blog Challenge: Month of July- Addressing Mental Health: The Positivity Trap | Beautiful Contemplations. This entry was posted in Beautiful Contemplations and tagged Blog For Mental Health 2014, health and wellness, mental health on 2014/08/28 by Ruby Tuesday. We hear so much about the negative side of having a mental illness, all of the stuff that can go wrong, the medication changes, the medication side effects, etc. Sure, that’s all part of it, but there’s so much more to it. Just as we are NOT our illness, these negative parts are NOT the whole of the illness either. There is so much good that can be accomplished as a result of having a mental illness…here are just a few. . .
3. There is an increased capacity/ability (even responsibility) to help others. Through sharing my story, starting support groups and even writing this blog, I am able to help others. That knowledge of not being alone in your mental illness is huge. . .
5. We have a very different outlook on the world. I know a lot of people see different as a negative thing, but I don’t. It is our way of thinking and seeing things that can bring about change. Change can be good. 6. You find out who your true friends are. You may lose a few friends or many along this journey. Those that leave are not bad/weak people. They just knew they may not have been able to handle it and be the support that you needed. The ones that remain are the ones worth keeping. Their bond is stronger than steel. 7. Once you’ve become more familiar with your illness, you don’t have to be enslaved by it. You can build on your strengths…knowledge is key. For instance, I have been able to use my education background to work with at-risk youth (elementary – high school) in my local school districts. Since i can empathize with these students, I am able to help them achieve academic goals. I’m also able to help them cope with what they are going through. As many teachers will tell you, we’re not just teachers. We are counselors, friends, sudo-parents, the list goes on and on. Read the rest of the story! Visit 10 Good Things About Having A Mental Illness | BravelyBipolar. Sometimes, I get all too caught up with living with several mental illnesses that it feels like that is all my life is about. It is all I am. I have forgotten what it was like not to have to report to my doctor and counselor weekly, I have forgotten what it was like not to have to swallow half a dozen or so tablets in one go. Forgotten what is like to live a normal day, sleep a normal night; have a normal schedule with things to look forward to. It feels like a dream at times though I have never actually gone to sleep. I have forgotten what it is like not to be afraid of razor blades, I have forgotten what it is like to shop for jewelry for its’ prettiness rather than its’ practicality for covering up wounds caused by self-infliction. . .
Today I made a choice, one that did not come lightly. For a fair while now I have had one assessment to complete and hand so I could pass a unit. It is no secret that I have had a tough semester this year at university. . . I decided today, that something just has to give, and if I must I have settled on redoing the unit next year. This means that my plans to do a master’s degree in social work will be set back further- but in the scheme of things I am not to bothered by this. But.. I fear that I will not be able to financially support myself much longer, as I am already skating on thin ice, in that department. Get a job they say, I am barely able to cope with my university work as it is let alone having the commitments of a job on top of that. Choose your priorities they say, this time last year I was peer mentoring for two separate organizations, public speaking and engaging in activism surrounding disability issues and was on community radio and in a lot of leadership programs on top of blogging, university coursework and managing my health. This year, I am a resident advisor and I am on community radio (I will be leaving this role shortly)- all the other commitments, I have had to drop due to an unforeseen relapse in mental health. Read the rest of the story! Visit Took The Pledge 2014 blog for mental health project: Update | Beautiful Contemplations. Today was another day that was filled with sleep. It makes me feel like such a failure. My colleagues don’t struggle to make it to work because they can’t get out of bed. The physicians in my family never even take a sick day. Some depressed people manage to take care of their families. I can barely take care of myself. What is my excuse for my weakness? Then I thought of physical conditions that leave people debilitated. Migraine headaches. Chronic Fatigue Syndrome. Lyme disease. Do the people who suffer from these conditions feel paralyzed with guilt and shame when they can’t get out of bed? Or do they accept their fatigue as being part of their illness rather than a personal failing? I think about the recommendations I give to clients who are depressed. Exercise. Get sunlight. Be social. Regulate your sleep cycle. If someone had the flu, you would tell them to rest. Listen to your body. But with depression, we tell people to ignore what their bodies and minds are telling them and to do the opposite. Fight it! Don’t give in! Don’t get me wrong. I do all of these things when I can, and they work. After sleeping most of the day, I forced myself to do laundry, get some lunch, wave at my neighbors, put together my tennis schedule for the new league, and play tennis for 3 hours to make up for my lack of steps from yesterday. And I’m writing this blog post now. . . There is an article circulating on the internet about how for some depressed people, positive reframing doesn’t work. Telling the person to be positive actually makes them feel worse. That it’s better to support them by expressing empathy for their feelings. Perhaps someday, researchers are going to find that listening to your body when you are depressed is sometimes more effective than fighting it with wakeful activities like forced exercise and socialization–two things that can be difficult to do even when you’re not depressed. Read the rest of the story! Visit Normal in Training: The Battle Against Depression. This entry was posted in Normal in Training and tagged Blog For Mental Health 2014, health and wellness, mental health on 2014/08/26 by Ruby Tuesday. Why is it that we (those of us with mental illness) have to try to bring each other down? Why can’t we truly support one another even when that support isn’t what we want to hear? How are we to ever come together as a cohesive unit for change? Is it even possible? . . . I refuse to go on the attack myself. It’s a waste of my energy and time. I would much rather focus on the task at hand: Bringing about meaning change in the government (both national and local) and bringing about change in this pervasive stigma on both our parts and those that don’t have a mental illness. Stigma is going to be our downfall. Education is going to change that. In order to educate, we have to accept what we have been given and be willing to talk about it. We can’t hold it inside and be ashamed of it. We have to be of one voice, one LOUD voice…and don’t forget gentle. We have to finess this. Stigma and prejudice won’t go away on their own. We have to be willing to stand up and be noticed, to get out from behind the shadows, to shed light on these illnesses. Read the rest of the story! Visit Misperceptions | BravelyBipolar. This entry was posted in BravelyBipolar and tagged Blog For Mental Health 2014, health and wellness, mental health on 2014/08/26 by Ruby Tuesday.